I’ve been thinking about this banana split chia seed pudding for a while now. I even bought the peanuts and pineapple I’d need and they’ve been sitting in my pantry ever since I dreamed this up…then today was the day. I needed banana split chia seed pudding in my life and it just had to happen. 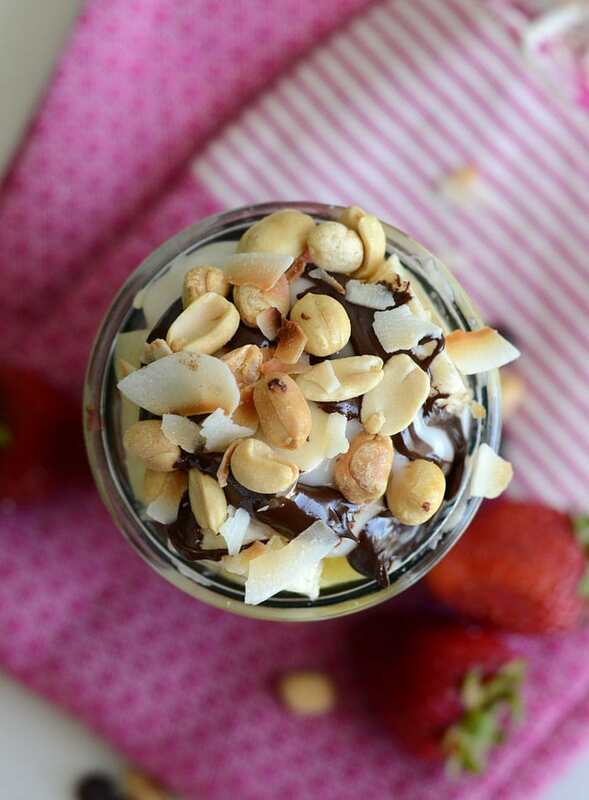 The flavour and texture of sliced strawberries, peanuts, banana, chocolate sauce mixed together with two kinds of chia seed pudding is juuuuust about perfect. I could eat this all day, every day. Let’s dig in. There are a bunch of different ways you could make this and I’m pretty sure any of them would be delicious. It’s really all about the toppings! Pick and choose to customize to your liking! Here’s what I went with. After those have been added, why not some..
Yep, starting to sound pretty good, don’t ya think? Traditionally a banana split has 3 kinds of ice cream: chocolate, vanilla and strawberry. I only made vanilla and chocolate chia seed pudding for this and then just topped it with sliced strawberries for the strawberry layer. This isn’t so much as recipe as it is an inspiration to have fun and make it your own! Eat it for breakfast, dessert or a snack! 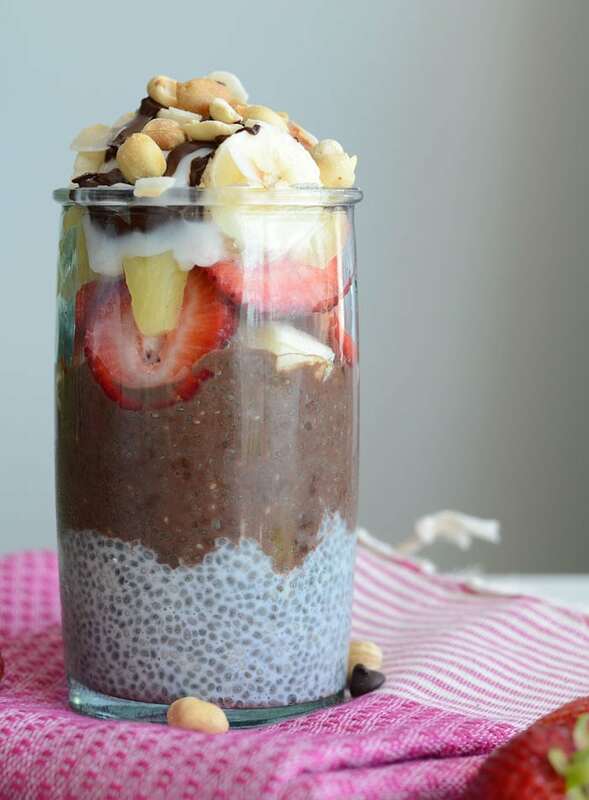 Even if you just make the vanilla chia seed pudding and add the toppings, it’s delicious! Add the ingredients for the chocolate chia seed pudding to a small container, mix vigorously, ensuring there are no clumps, then place in the fridge. I recommend adding the almond milk first, then stirring in the chia seeds and cocoa, then shaking vigorously. Make sure it’s well mixed. In a separate container, do the same for the vanilla chia seed pudding. Let them sit in the fridge for at least a few hours, up until overnight. 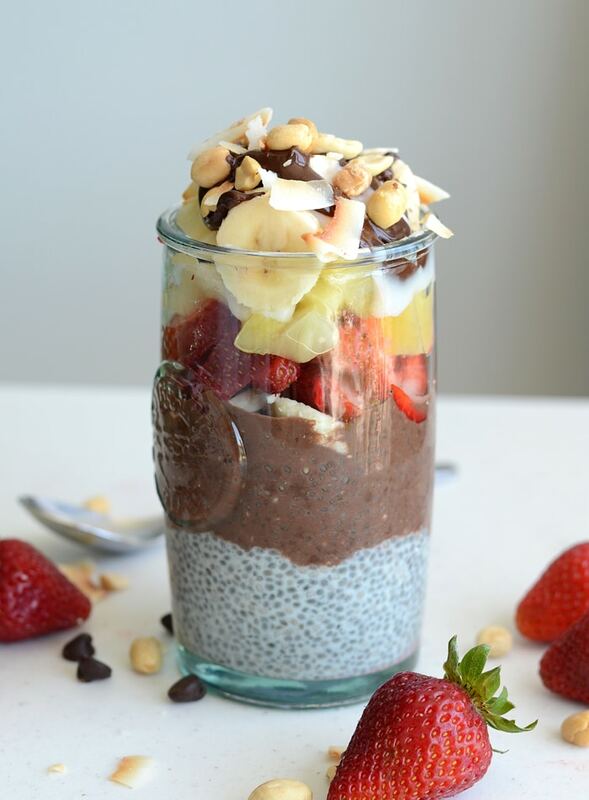 Add the vanilla chia seed pudding to a glass or jar, then add the chocolate chia seed pudding on top to form a second layer. Optional: add a layer of strawberry jam or strawberry chia seed pudding. Add your toppings and dig in!! 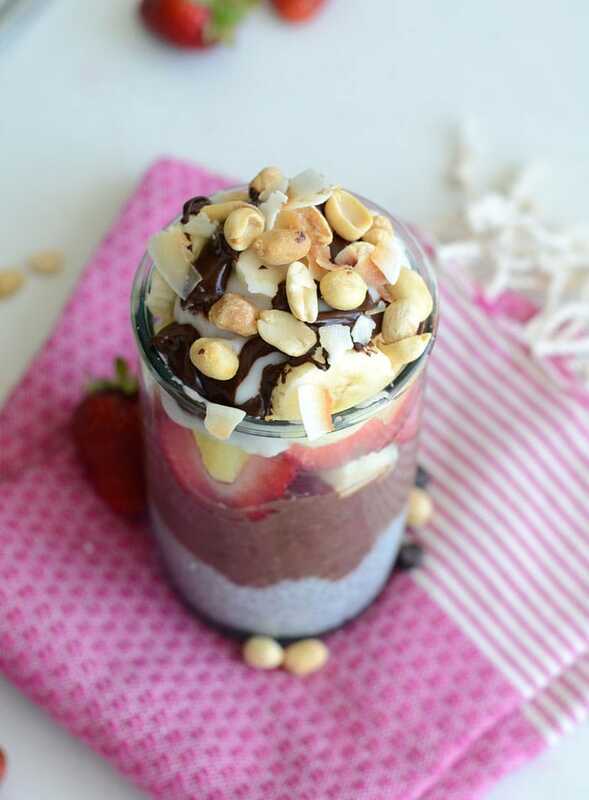 To make a layer of strawberry chia seed pudding, place 2 tbsp chia seeds in a container with 1/3 cup almond milk and either 2-3 pureed fresh strawberries or 1 tbsp of strawberry jam. If you use fresh strawberries you may want to add a little sweetener. Let sit in the fridge for an hour, up until overnight. Shop chia seeds on Amazon. Shop liquid stevia on Amazon. I also love using chia seeds in homemade energy bar recipes! 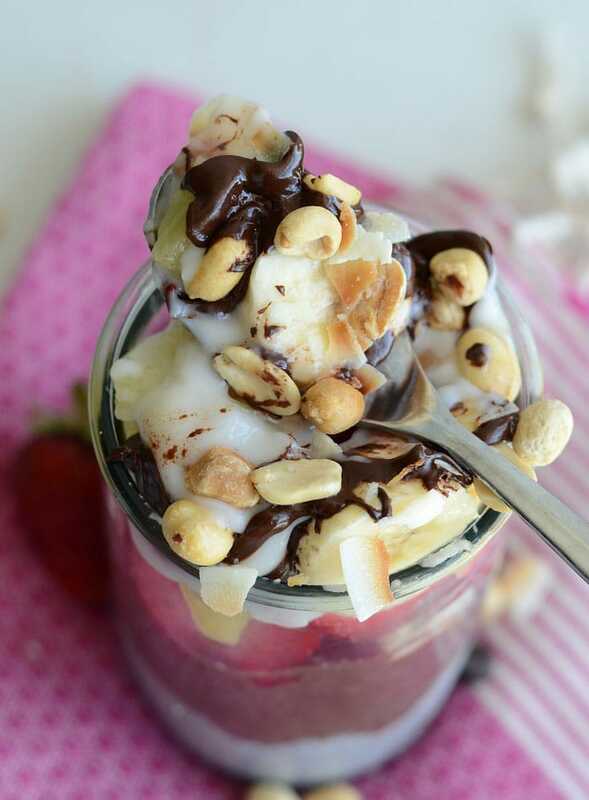 Thanks for checking out my Banana Split Chia Seed Pudding! Let me know if you give it a try! 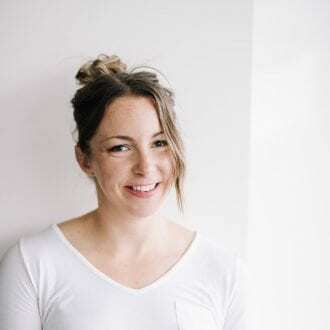 Don’t forget to share this post via your favourite social media network below, spreading the word so I can keep Running on Real Food up and running! Love ya, D.
Since it’s summer, banana splits need to happen WAY more often. I love them so much! The layers look absolutely fantastic! Hey Deryn! 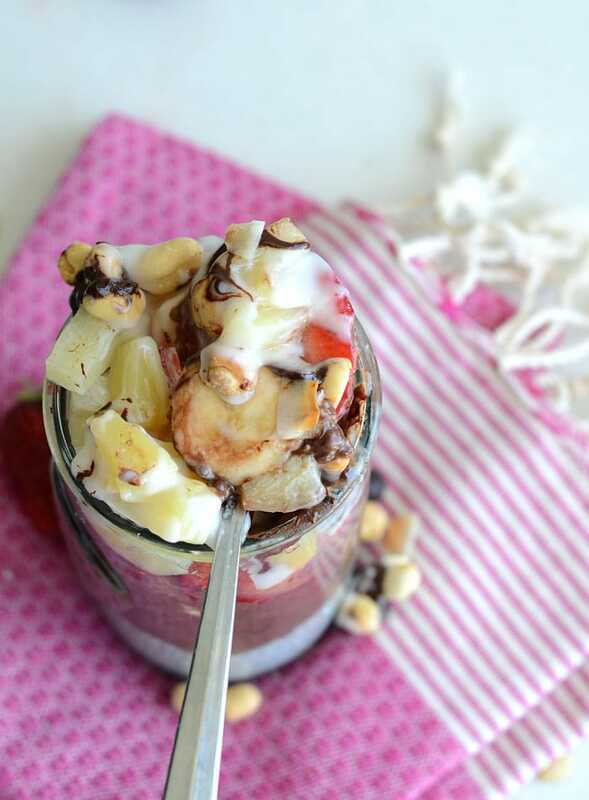 I am in love with this banana split chia seed pudding parfait…It looks so delicious…Yum!! 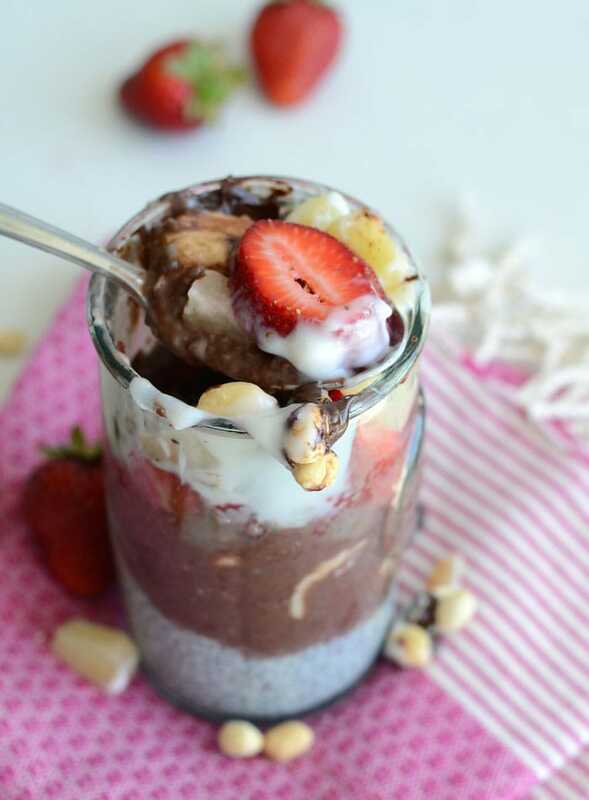 I give banana split chia seed pudding 5 star because this recipe has almost 25g protein which is very good. Totally! I love these flavours together any which way! Oh my, this was so grand. My son even enjoyed a it. Thanks so much for this fabulous recipe.